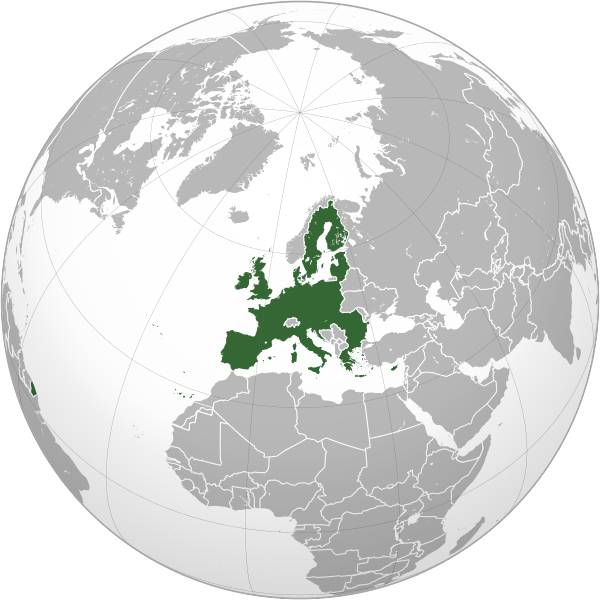 The following image depicts the most important naval forces by each member state of the European Union. I decided to not include only the quantities but also to include the classes. Therefore, I made it easier for the reader to realize where these numbers came from and the most important to check and to understand why a class belongs to a specific category of warships. 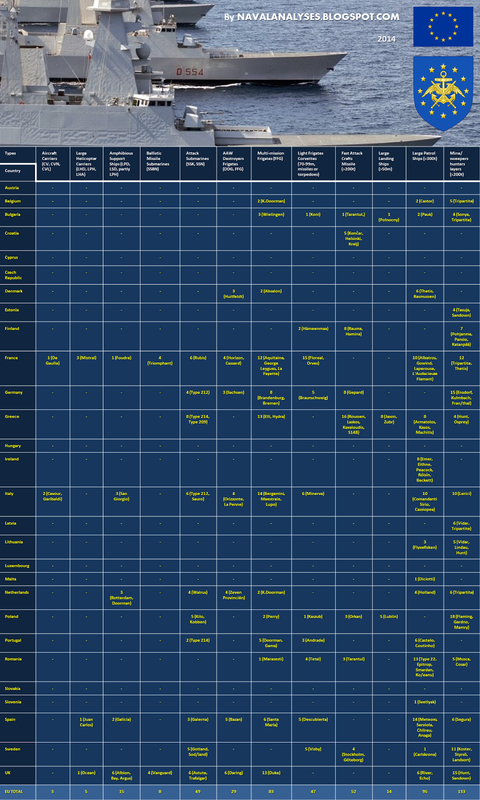 Before starting completing this large table, I created some criteria that helped me to categorize better each class and to make a fair allocation of the warships that each EU country-member has in type of warships. I avoided each country's system of pennant numbers such as -D- for George Leygues class making them in that way to belong to destroyer type despite the non destroyer's capabilities and the small size of the class. I tried to avoid also the unfair categorization of warships in a higher position in the hierarchy such as the Pauk or Joao Coutinho class to corvettes without having missile launch capability while other larger ships such as those of Holland class are classified as oceanic patrol vessels. I tried to avoid all these unfair classifications and based on capabilities, size and armament I divided all the classes (in brackets) except of the auxiliary ships in twelve (12) main types/categories. Anti-Aircraft Warfare (AAW) Destroyers and Frigates: in this category they belong ships that have the primary mission to provide anti-aircraft protection to other ships and for this role they are equipped with launcher(s) dedicated to this role and only. Perry class frigates are excluded because they have a single launcher to fire both anti-aircraft missiles (AAM) and surface-surface missiles (SSM). Multi-mission Frigates: ships larger than 100m that carry missiles and capable to carry out a large variety of missions. Light Frigates and Corvettes: ships between 70-99m that are equipped with missile or torpedo launchers performing as light frigates (FL). Here also belongs the Finnish Hamenmaa class despite the main mission of minelaying as the ships have such equipment and armament that can have the role of a major surface combatant. Fast Attack Craft Missile: boats that are fast, small in size (not less than 200t at full load) and they carry surface-to-surface missiles (SSM). Large Patrol Ships: large and seaworthy patrol vessels enough to patrol off-shore in the open ocean (OPV). In general ships that are larger than 300t in displacement at full load and they are armed mainly with guns, ships with or without helicopter deck and/or hangar and their primary mission is surveillance. Danish ships have the provision to be equipped with missiles via the StanFlex modules but they are are not equipped with them and they operate as ocean patrol ships. Also, the Romanian Type 22, even though are very large as frigates, they are equipped only with a 3in naval gun and they can operate only as large ocean patrol vessels. Mine-sweepers/hunters/layers: mine countermeasure vessels (MCM) larger than 200t with the primary role of mine sweeping, mine laying or mine hunting. 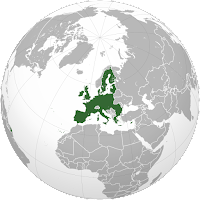 European Union's Naval Forces in 2014. In high resolution click here. 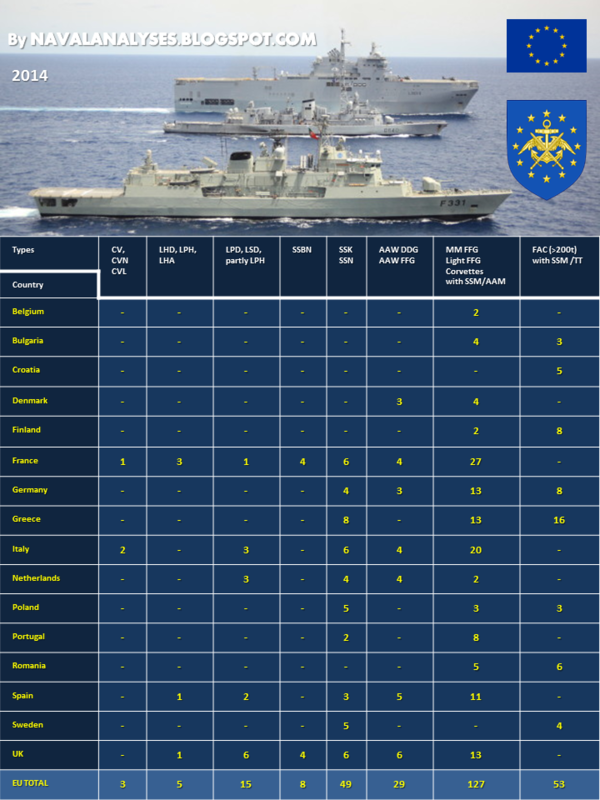 And a simplified version with new classification including the most important surface combatants in a naval warfare of each EU member state. 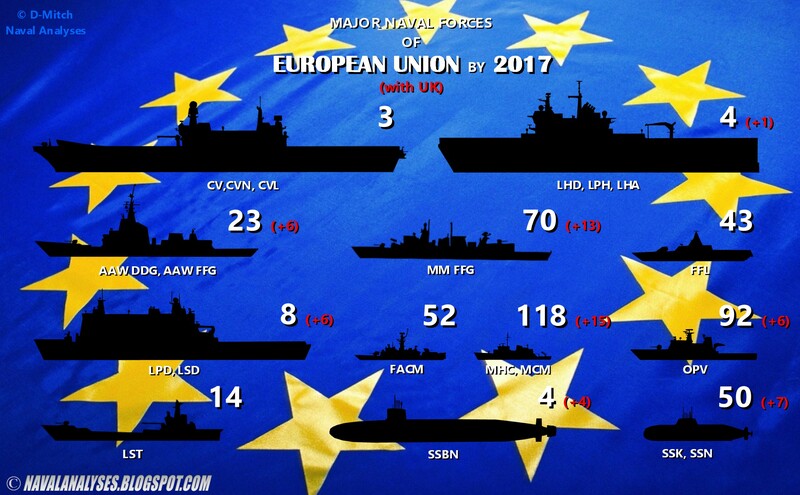 European Union's Naval Forces in 2014 - simplified version. In high resolution click here. It took me time and enough effort to create these images due to the fact that the modern warships have not the distinct roles, appearances, armaments and sizes of the warships of the past. Many navies use their own classification for different reasons (political etc.). Designs have changed and the small frigates have become large as the cruisers in WWII or designs similar in size of a cruiser are classified as destroyers. Anyway, if you find something that it should change or something that is missing, I am open for discussion and of course I am always happy to receive comments! The European Union naval forces by 2017 without the UK (in brackets with). High resolution image here.